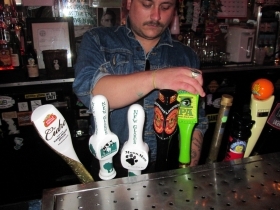 For decades a mom-and-pop tavern; now a hip hangout. High Dive. Photo by Michael Horne. 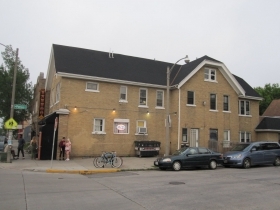 The High Dive is the closest tavern to the nerve center of the Riverwest 24 Hour Bike Race, which will run from 7 p.m. July 28th to 7 p.m. July 29th. The start and finish line is set up on N. Pierce St., just south of the High Dive, an old bar at 701 E. Center St. All bicyclists must pass this bicycle-friendly bar as they pedal through the checkpoints in the neighborhood. Spectators and hangers-on also find this to be a prime spot. Last year’s race’s male winner in the solo category, “El Jeffe,” made a total of 57 circuits around this corner, totaling 262 miles of cycling in his 24-hour quest. The admirable dedication to community and the bicycle is to be commended on the part of “El Jeffe,” although there are those whose sympathies lie with “This is Not a Real Team,” who made but one circuit before lying down his bicycle, and then possibly headed to a place like this tavern. Sometimes it’s just more fun to watch the world roll by from a barstool. The High Dive occupies 2,177 square feet in a building so old that it had its first alterations as early as 1891. The exact date of its construction is not known, but it was probably just before the city began requiring building permits in the late 1880’s. This was a period of rapid growth in the population of Milwaukee. In the ten years from 1880-1890, the city’s population increased from 115,587 to 204,468. By 1900, the city held 285,315 residents, many of them foreign born. There were 60,000 native born Poles in the city — a population second only to the native-born Germans — and many of them were drawn to the humble yet vital neighborhood west of the Milwaukee River about two miles northeast of downtown. In 1891 we see that a German, Charles Pittelkow, owned the building, which he had certainly financed, possibly for another, or as an investment property. “Honest Uncle Charlie” came to Milwaukee in 1878 with the intent of helping immigrants finance housing. Immigrant workers, who traveled here alone, would deposit their savings with Pittelkow, hoping to save up enough to transport their families from the old country. Pittelkow would lend the deposits to other immigrants who wanted to buy homes. Pittelkow’s business is now The Equitable Bank, now headed by today’s Charles R. Pittelkow, a great-grandson of the founder. In 1891, Pittelkow took out a permit to make alterations to have the building operate as a “Feed Store.” What is a feed store? Why, once upon a time they were as common as pickle factories or vinegar makers on the streets of Milwaukee. They sold feed for animals, mostly, along with flour for housewives, and maybe a little malted barley here and there for the homebrewers. These decentralized stores, found in most any neighborhood, were handy outposts to provision the tens of thousands of horses that lived on the crowded blocks they shared with the immigrants throughout the entire community. Also, at the time, the farms north of the city were just blocks away. The building drops out of the public record until 1927 when Steve Walczak enters the picture as the operator of a licensed “Soft Drink Parlor” here, a sure sign that it had served as a saloon for some period of time prior to Prohibition and post feed store. Walczak invested $5,000 to construct the bungalow-style living quarters to the south of the building. He tore down a couple of sheds to do so. Walczak also clad the entire building in brick, and underpinned the foundation of the old building to the extent that it could bear the weight of the terazzo floors installed there in the remodeling. The bathrooms got a hexagonal tile treatment. The floors remain. By 1928, with his building done, and most horses gone, Walczak was one of the hundreds of Riverwest residents who erected a garage on his property. It was a nice brick number, and also remains. By 1935, Walczak ran his saloon openly, now that Prohibition was done, and built a building on the vacant lot he owned to the east for the Daintie Ice Cream Company. He got a permit to store his “ice cream mixture supplies” in the garage. By 1939, John Markiewicz took over the tavern, if not the real estate. By 1945, with the war over and thousands of soldiers returning to what would become a booming manufacturing center, the working-class tavern was run by Paul Schempf, who operated the place under the clever name of “Paul’s In Tap.” Paul was always in, since he lived in the back. 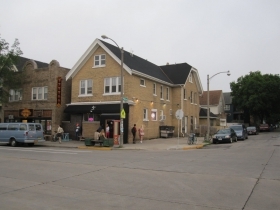 In October 1953, Schempf made his own changes to the building that he owned and operated, and got a permit for “alterations to Front, change over to Modern.” That is to say, the lovely storefront windows that were original to the bar were replaced with today’s narrow slits bordered by a sandstone trim. We have seen the same treatment elsewhere, including at the Falcon Bowl and Klinger’s East, both nearby. Some contractor had a pretty good business going on back then. Contractors today are busy reversing such modernizations in favor of the historic originals, and this place could use a facelift. By 1959, there was a projecting Blatz sign hung diagonally from the northwest corner of the building so it could be seen by traffic in all four directions at the busy intersection. 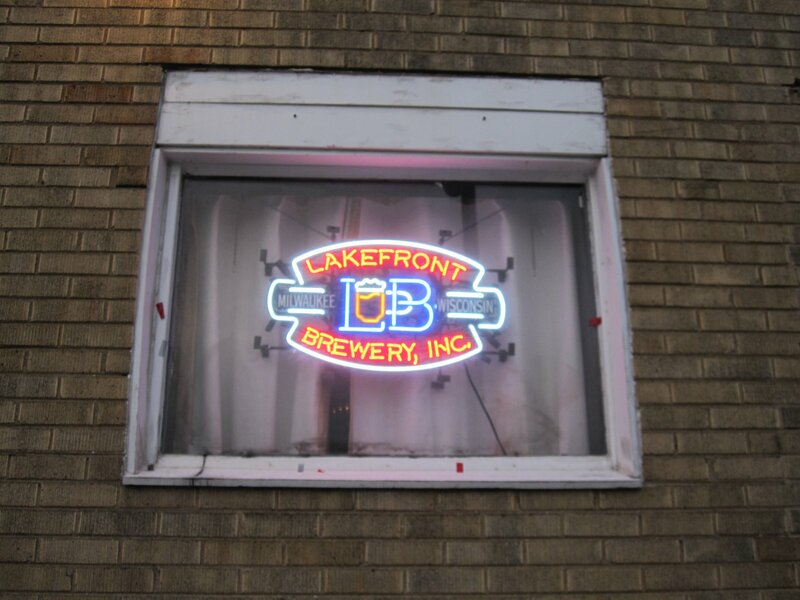 In 1962, the Blatz sign was given added punch with the addition of a neon “OPEN” sign. In 1967, Anthony Lusic and his wife operated the place, giving it the name of “Tony and Esthers,” which is about as mom-and-pop of a name for a bar as one could imagine. Such couplings were common in working class taverns of the era, when a place like this could be rented for $305 per month. On November 27th, 1967, the inspector sent a stern letter to Tony and Esther, who perhaps were not too particular about the legalities of running a saloon. Esther probably tended to the bar customers while Tony raced downtown to get his permit. By 1976 Lusic was dead and his estate sold the business and building to Tony Balistreri for $40,000. Tony took down the Blatz sign and replaced it with an Old Style sign in 1978. 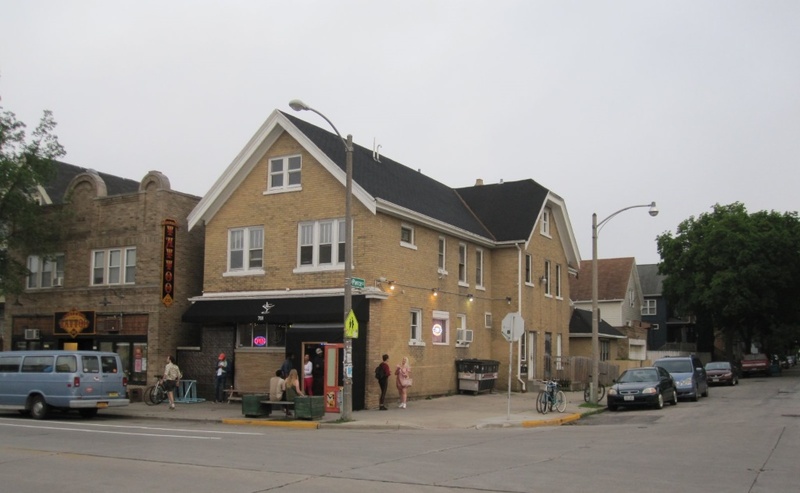 The bar was known as “Tony’s Place” until the 1990s. Later the tavern became the River Horse, and in 2012 was known for a while as the Impala Lounge. The business was sold to the current owner and opened as the High Dive in 2015. Today the tavern has lost the mom-and-pop feeling, and is oriented toward the new immigrants to Riverwest, many of whom bicycle, work in service industry jobs, and perhaps need a place to grab a beer as they search their bodies for a blank spot to be filled in the tattoo parlor next door. 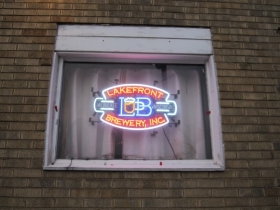 Lakefront Brewery sign. Photo by Michael Horne. 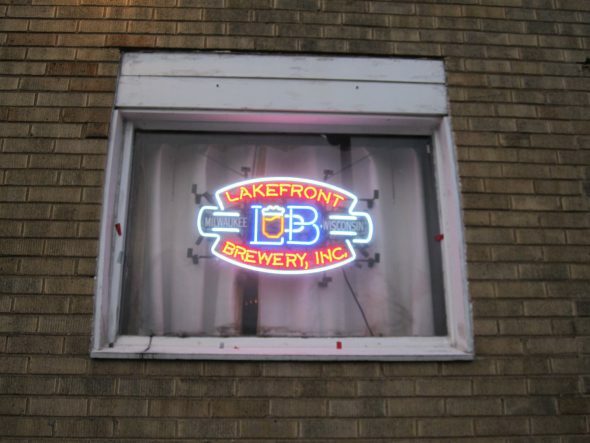 A Lakefront Brewery sign glows in the window facing N. Pierce St., where it will be the backdrop of many a Riverwest 24 photograph. Due to its domestic-style architecture, with coved ceilings, arched doorways and oak trim, the place seems smaller than its 2,000 plus square foot size, which serves to enhance its hominess. Posters on the wall feature such things as “Trivia Mafia” on Tuesdays at 7:30 p.m., and the 28th annual Energy Fair to be held in Custer Wisconsin from June 16th to 19th. Another poster reminds us that Filth Fest will be taking over the neighborhood this weekend as well. They just didn’t have Queer Punk Fests back in Tony and Esther’s day, so this is a sign of neighborhood progress. So is the drink selection, which includes daily specials along with those fancy cocktails kids are so crazy about nowadays. 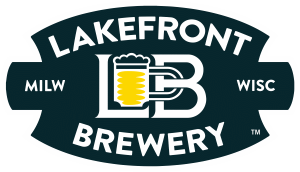 The beer list is large, both bottled and on draft, including such specialty products as “Butterfly Fart” beer. I bet Esther would have walloped you a good one if you talked butterfly farts around her. Decor is kept to a minimum, with the most intriguing display being a pair of water skis and a life ring poised below them reading “Orient Line,” with the neat “High Dive” logo within its center. I guess some customer was on a boat at one time. Hope it doesn’t sink. 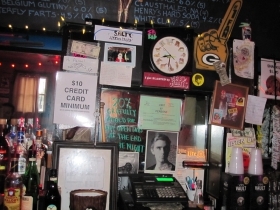 There is a Rolling Stone poster, a framed character on a surfboard, and a curious incised stemmed cocktail glass on a locked cabinet door below the bar. 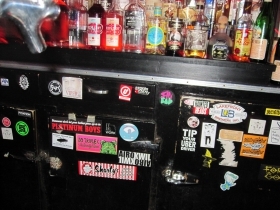 The back bar is plastered with stickers from countless bands, breweries, marijuana advocacy groups and past Riverwest 24 races. Whichever. Photo by Michael Horne. The two bathrooms, with their hexagonal tiled floors, are each adorned with a sign reading “Whichever” on their 1927-vintage oak paneled doors. However, a visit to each readily distinguishes between the former men’s and women’s rooms. The former is equipped with a urinal which has been out of service for quite some years. Bright pink ribbons discourage its use, or may be intended to turn urination into a sport. Here too the walls are plastered with graffiti, some of it spray-painted. An area that had been covered by a mirror, until its upper right corner had been smashed, now bears a WMSE sticker, and the wooden slab that covers the water closet (possibly replacing a smashed original) is likewise heavily graffitied. Some people have a lot of time and plenty of money for markers. 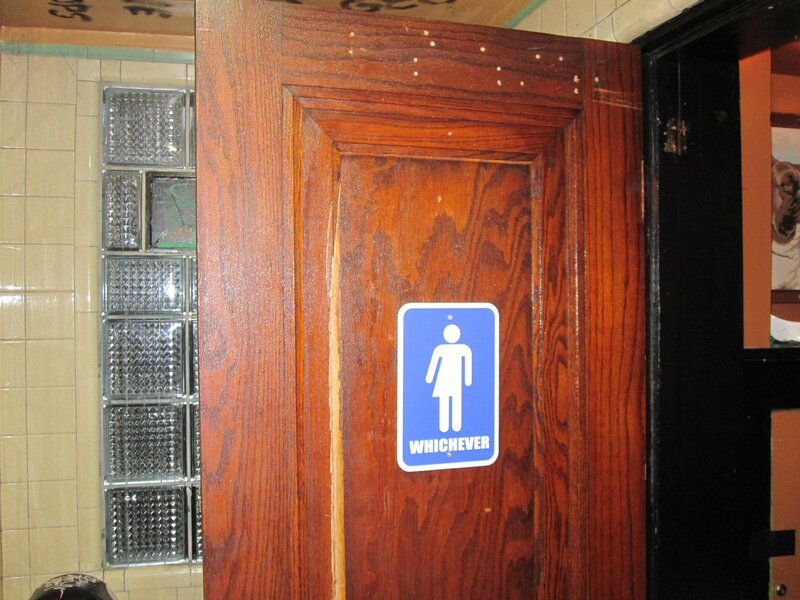 By contrast, the former women’s room is almost surgical in appearance and comparative cleanliness, perhaps due to infrequent use. Beyond these rooms, set in a little alcove is a game room with four pinball machines, which are said to be most excellent by enthusiasts. Riverwest taverns are either so clean they’re shiny, while at others folks are too shined up to clean, we would have to assign this to the latter category, along with such landmarks as the Bremen Cafe, where this phenomenon has been previously noted. Year Established: A tavern for over a century, as High Dive since 2015. Year Building Constructed: Original structure built in 1891, with major renovation in 1928, adding bungalow addition to south, cladding building in brick, underpinning the original structure and installing terazzo and tile floors. Current sandstone storefront with horizontal fenestration dates to 1953. Description: A classic Mom and Pop bar where the parents are on vacation and the kids have invited their buddies over for some fun. Tony and Esther simply wouldn’t understand it. Estimated Annual Rent: 2,177 sq. ft. bar area at $8.82 sq. ft. = $19,201.14 per year, according to the City Assessor’s calculations. Property is assessed at $9,000 for the 3,600 sq. ft. lot ($2.50/sq. ft.) and $209,000 for the 3,862 sq. ft. building for a total assessed valuation of $218,000. Property taxes: $5,731 Net Tax Paid in Full. Property Owner: Brittain Brothers LLC. County Supervisor District: 13th; Willie Johnson, Jr. The Verdict was researched by Amanda Maniscalco. But why is The High Dive called The High Dive? Thanks again for another wonderful article, Michael Horne!